Our rockstar girls weren’t finished for the day, though – onto a cross-country school! Rachel has been out once before, but it was Delilah’s first time. I was super impressed by the boldness of both mares. Rachel popped through most of the Training level combinations on the course (banks, ditches, water, etc.) 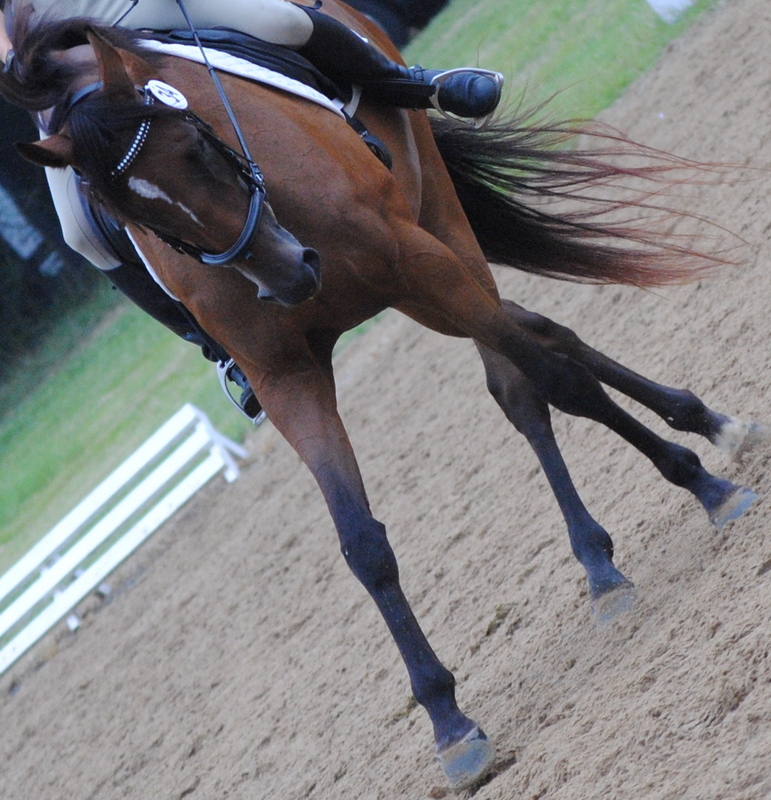 and even did the Prelim sunken road without batting an eye. It seemed she’d be willing to play the role as a lead for Delilah on her first xc school, so Becca hopped on my Rachie and we played follow the leader into the water, down a bank, and over a few little fences until it seemed Delilah had it all figured out! Both girls were great and, as I said, I’m excited for the fall event season with both of them. Rachel schooled a bit of height for the first time the other day, and it was pretty cool to feel her pop over a few 4′ verticals all neat and tidy like that…such power in my baby girl!! Speaking of power, I’m a total pro with the power tools now. Yes, I am patting myself on the back for the new stalls I’ve built on the side of the barn. Now I’ll admit, the basic frame of the side shed was put up by Momma Briggs, Daddy Bill, and a student’s son…but those stall fronts are all me, baby! And speaking of all me, I’m about to be left by my working student (SCHOOL?? Pshhh, who needs that?!? *Kidding*) so I’m going to have to get used to being all alone at the barn every morning…all alone, yeah right, there’s enough personality going on in these characters called my horses that it’s NEVER lonely! Okay, now onto River Glen. What a weekend! I have to go ahead and admit that Pirate and I darn near never made it into dressage. This sounds like a super lame excuse, but my alarm never went off, and long story short, I woke up at the time Pirate and I were supposed to be pulling out of Holly’s house. Ruh-roh. I flew out of the house to feed Baby P, threw on my clothes (yes, in that order), tacked up my handsome Thoroughbred, and hit the road 45 minutes before I was due up centerline. (Holly lives 40 minutes away from River Glen). Holly drove my trailer while I pulled on boots/coat/gloves/helmet/etc. and I jumped out of the truck when we hit River Glen’s driveway to bridle Pirate as we drove down the lane. 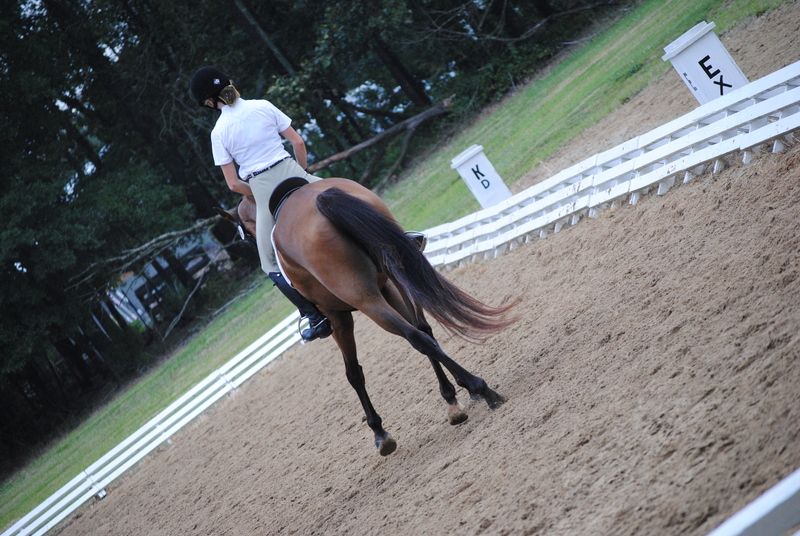 Holly pulled up in front of the dressage arena, I unloaded P on the driveway and hopped on, and we trotted around warm-up briefly before trotting down centerline and scoring our best score at the Intermediate level so far. We scored 8s on our medium trots, counter canters, and several transitions, and a bunch of 7s, including all 7s in the collective marks. That’s my boy, P!!!!!!!!! The stadium seemed challenging and when someone before us pulled 8 rails I thought, “Ruh roh” for the second time of the morning, but P was fantastic. We had two down (my fault, of course) but that was still one of the best rounds of the day, and I was thrilled with my boy. We were finished up by 10 AM, so I was able to spend some time visiting with my cousin, John, who lives in Knoxville…like I said, River Glen feels like vacation time to me! The following morning we ran cross-country, and Pirate jumped brilliantly (one table was kinda ugly, but I believe P just couldn’t be bothered to pick up his feet as it was on the small side…silly boy! ), pulling me through lines of skinnies, angles, and particularly the corner, where when I pointed him a bit towards the flower pot in the middle, he stayed so true to his line that he jumped the whole darn corner like it was a table, right in the middle….sheesh, he can jump!!! Unfortunately, though, I can’t say our end result reflected the general good feel of the event. After galloping through the angled rolltops and over the skinny at the bottom of the hill, we made the turn for the water, which had a combination going in to a large drop, followed by a sharp left before a double of skinnies. I love River Glen, but there was just something about the water that seemed trappy this time…I just didn’t like the “in.” Pirate agreed. He jumped the log at the A element, and then said “WHOA dude!” at the drop. Pirate loves, and I mean LOVES, drops into water…the one at The Fork was certainly bigger, and he launched in there. He is anything but a stopper. But he did not like the look of this one…so, a couple of fences from home, we were finished. It’s a bit of a bummer if you’re looking at the scorecard, especially because we’d have finished right up there, but you know what? I was still all smiles walking him off the course, though I did have to turn to the whole crowd gathered at the water and say, “Geeze, it had to happen in front of everyone, didn’t it? !” Hey, can’t win ‘em all, kid. P’s always a rockstar, no matter what. Still, the mares had to rub it in his face that while HE came home from his event with nothin’, THEY both brought home blue ribbons the following weekend. I have another little mare in training with me who’s going cross-country schooling next week, and I’m busy planning out the season for all the girls…yep, all the about the ladies right now. Not to worry, though; don’t you all know that Pirate’s a ladies man?! 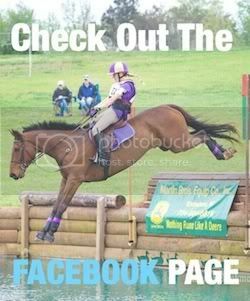 Posted in Blog and tagged with Cross Country, Fox Hollow Farm, Horse trainer, Kelsey Briggs, Kelsey Briggs eventing, River Glen Horse Trials, The Gentleman Pirate, Three Day Eventing, XC. RSS 2.0 feed. « I Remember MY First Cross-rail….